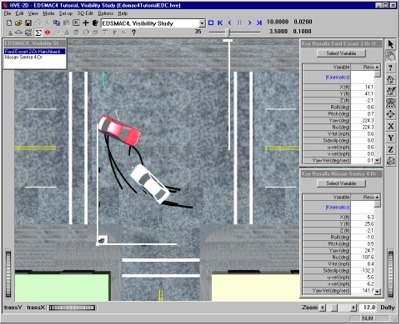 EDSMAC is an analysis of single- or two-vehicle accidents, including collision. Based on the SMAC model originally developed at Calspan, EDSMAC also includes numerous enhancements developed by Engineering Dynamics Corporation. EDSMAC may be used to predict and visualize vehicle response before, during and after impact. Accident investigators can use EDSMAC to determine impact velocity and delta-V. The procedure involves an initial estimate of the conditions of impact made by the user or supplied by an EDCRASH reconstruction; this is followed by a series of user-defined adjustments to the initial conditions until the final results duplicate the physical evidence (rest positions and vehicle damage) found at the accident site. EDSMAC computes collision and tire forces at user-specified timesteps. The program then displays the results visually on a scaled crash site diagram and numerically in the form of vehicle kinematics (position/velocity/acceleration vs. time), tire forces and driver inputs (throttle, braking and steering). EDSMAC is a 3-degree of freedom (X, Y, PSI) yaw-plane analysis; suspension effects are ignored. The collision is analyzed by establishing a force balance between the vehicles as they crush (impact). The force vectors act upon the vehicle CGs until separation occurs. The conditions of separation provide the initial conditions for a trajectory simulation, which analyzes the impact-to-rest phase using the Fiala tire model. EDSMAC has been validated using the RICSAC collision experiments; a set of 12 well-instrumented staged collisions. Numerous validation studies are published in the technical literature. Selectable from HVE-2Ds built-in databases, according to Type (Passenger Car, Pickup, Sport-Utility, Van, Truck), Make, Model, Year, Body Style. Several Vehicle Database Sources (Generic, EDVDB, User and others). Work directly on a scaled crash site diagram. User-definable friction zones such as asphalt, gravel, grass, standing water, oil spill . . .
Drag-and-drop positioning of vehicles in the environment. Open-loop driver control tables (throttle, braking and steering). Simulation Controls (integration timesteps for collision, separation and trajectory phases, termination velocities, maximum simulation time and output time interval). Vehicle Kinematics (position, velocity, acceleration vs. time). Tire Data (contact patch coordinates, forces, slip angle, skid status vs. time). Wheel Data (coordinates, steer angle vs. time). Visualization of vehicle motion on the crash site diagram at user-specified time intervals. Accident History (initial, impact, separation and final/rest positions and velocities). Damage Data (profile, CDC, PDOF, delta-V). Driver Controls (throttle, braking and steering). Simulation Controls (numerical integration parameters). Vehicle Data (dimensions, inertias, stiffness, and tire properties).